What Fully Integrated Appliances Should You Have in Your Kitchen? Which integrated appliances will you choose for your kitchen? Choosing your appliances can be quite confusing during the hustle and bustle of a kitchen makeover. From built-in to integrated appliances, there are several different appliance styles for you to choose from. But when it comes to fully integrated appliances, which appliances should you have in your kitchen? Let’s take a look at what fully integrated appliances are and which ones should be included in your kitchen makeover. What are Fully Integrated Appliances? Fully integrated appliances work like a normal appliance but are styled to blend into your kitchen cabinet designs. This is one of the main differences between an overlay and a fully integrated refrigerator. Fully integrated units are completely camouflaged into your cabinets when they are installed. There will not be any visible hinges or compressor vents to give your appliances away. When they are closed, these appliances look identical to the kitchen cabinets. These appliances are one of the top choices for kitchen designers because they do not take away from the design and adds more versatility to the space. What Appliances Should Be Fully Integrated in Your Kitchen? There are a lot of options for you to choose from when selecting your appliances for your kitchen remodel. During this process, it is important for you to think about your space as well as which appliances you would like it your kitchen. Many homeowners choose to integrate their refrigerator, dishwasher, and oven while leaving their stove top unintegrated into its surroundings. Another option for your kitchen remodel is to integrate the refrigerator and dishwasher while having your oven and microwave as built-ins, which will stand out from your cabinets for a modern design. Choosing what appliances should be fully integrated into your kitchen should be something you should discuss with your Kenwood Kitchens designer. Many homeowners prefer to avoid the dated look of black and white appliance but also wish to avoid the cold, harsh look of stainless steel. 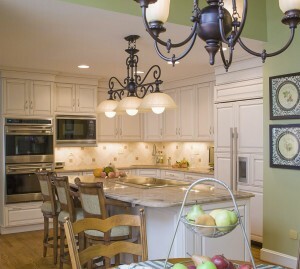 Fully integrated kitchen appliances can add a warm, cozy look to your kitchen that other appliances do not. For more information on choosing your fully integrated appliances, call Kenwood Kitchens today! Fully Integrated Appliances with Kenwood Kitchens! Since opening its doors in 1974, Kenwood Kitchens has made a name for itself throughout Maryland as a complete kitchen and bathroom remodeling firm. With showrooms located in Lutherville, Abingdon, Columbia or Annapolis, Maryland, Kenwood Kitchens is the place for all of your kitchen and bathroom needs. If you are interested in remodeling your kitchen or bathroom – or, need cabinets for any part of your home, please call Kenwood Kitchens at (800) 211-8394. Follow us on Facebook, Twitter, Google+, Pinterest, and LinkedIn! This entry was posted on Friday, August 5th, 2016 at 4:13 pm. Both comments and pings are currently closed.